Peugeot, any way you pronounce it, you’ll be close! 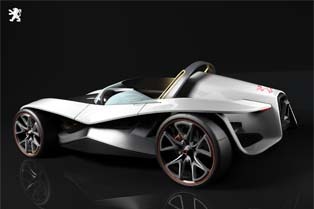 Yes, Peugeot’s yearly design contest for aspiring transportation designers is upon us. The top thirty are there for us to revel in, in all their glory. Here are the top 10, and here are the 20 behind them. This year’s well caffeinated young designers will have spent this semester (and possibly longer) sketching their brains out to Peugeot’s theme of PLEASE Innovate, with the word PLEASE forming a clever acronym of: Pleasurable (to drive), Lively, Efficient, Accessible, Simple, and Ecological. Apparently this meant to the students, crazy shapes that have nothing to do with going fast, and inserting imagined eecological nuace. Arrgh! Read morePeugeot, any way you pronounce it, you’ll be close! So be looking for wafer thin telephoto lenses. Yep, those peppy gents at UCSD (San Diego) with more brains than brawn (but are probably great surfers anyhow) have developed a thin telephoto lens. How thin is this lens? 5mm is equal to a focal length of 38mm. So yeah,, WOW!! This sort of stuff is in the waaay cool category, as it has applications for many different imaging systems we all deal with on a daily basis. 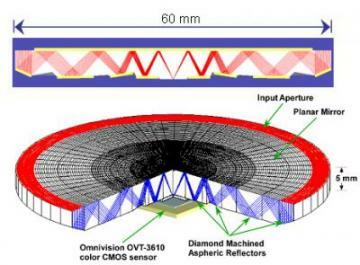 From cell phone cameras, to in car cameras (I’m looking at you Coulthard), to Micro Air Vehicles, security cameras, and anywhere else you want to slap a camera; now you can do it in the smallest thickness possible. Best of all, this develops a concept that was brand new in 1672,, so, uhhh, we’re on the leading edge here. Looks like Coolest Gadgets is going on an alarm clock spree, with the Motivational MP3 Alarm Clock mentioned earlier followed by this Puzzle Alarm Clock that comes with the manufacturer’s guarantee of waking you up. If pouring cold water on your face or sprinkling frozen marbles all over you bed still fails to get you out of bed, perhaps the Puzzle Alarm Clock will be able to help. 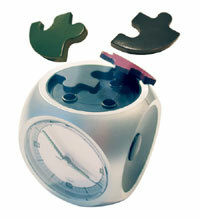 When the appointed time arrives to open your eyes, the four puzzle pieces connected to the Puzzle Alarm Clock will be fired up in the air – followed by an incessant ringing that will not stop until you manage to find all four pieces and place them back into the clock itself. If you’re a sucker for puzzle games and have long outgrown the tried and tested Rubik’s Cube, perhaps it is time to move on to more challenging brain teasers. 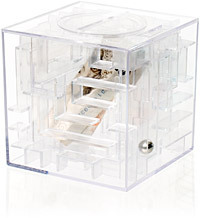 The Money Maze shares a resemblance with a transparent Borg starship, but it offers nothing of the assimilation sort. Instead, the Money Maze encourages you to place a valuable piece of paper inside, forcing you to work for it during retrieval. Of course money comes into mind, but it could be other priceless items like your recently deceased Uncle Bill’s will, a gift certificate, or even tickets to the opera. Sadistic users will torture themselves by stuffing money inside, while other well meaning adults can give a cash gift inside the Money Maze. Some people are just annoying and deserve to be messed with for whatever reason. Seriously, you just need to show them what being annoying really means. Well, thank God for Think Geek, because they’re here for you with the Annoy-a-tron. And although it looks like it goes in a computer, rest assured, it doesn’t. That would be too nerdy. Apparently yes. There is a fashion designer called Hussein Chalayan who created a partnership with an engineering company to create futuristic dresses that change themselves on the fly. 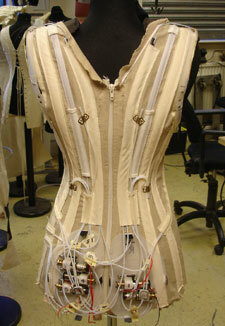 The morphings range from necklines that disappear to skirts that shorten and dresses that zip and unzip autonomously. Here is a description from Rob Edkins, director of the engineering company that teamup up with the designer: “Basically, the dresses were driven electronically by controlled, geared motors. We made… little pads for the models… within these containers we had all the battery packs, controlling chips–the microcontrollers and microswitches–and little geared motors. 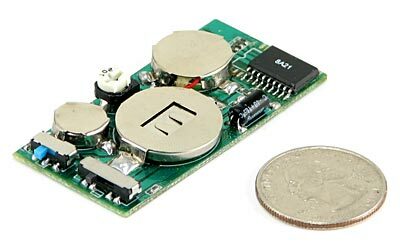 The motors we used were tiny, about a third of the size of a pencil and nine millimeters in diameter.